Awesome gluten free experience at Tusker House at Animal kingdom in WDW. If you’ve never been to the Tusker House at Animal Kingdom, you’re missing out. An “open air” market restaurant, the atmosphere is fantastic, the food wonderful and it’s just plain fun! Tusker House is less expensive than other character dining, making it a good value if paying out of pocket, but a poor value on the Disney Dining Plan. In addition to accepting the Disney Dining Plan (1 credit), Tusker HouseÂ accepts theÂ Tables in Wonderland card for a 20% discount. Before we dig into the food, letâ€™s talk ambiance at Tusker House. Itâ€™s no surprise that the theming at Tusker House is top notch, with incredible attention to detail and a lot fun little touches. It actually looks like a weathered marketplace you might find in Africa. You know, if Disney characters roamed African marketplaces. 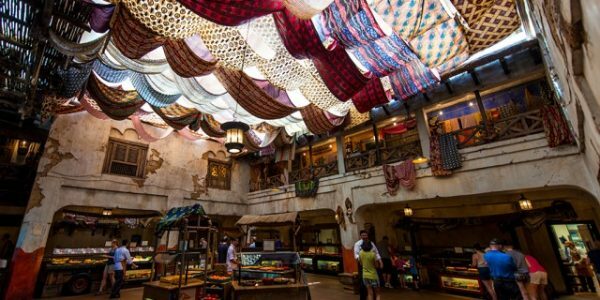 With the exception of the touches of Disney, Tusker Houseâ€™s theme is executed so well that you might be able to pass photos of it off as an actual marketplace in Africa. No detail is overlooked, and the restaurant really works well, especially for an adult audience. The chef’s walk you through the buffet line, pointing out everything you can have, which is quite a lot. You won’t go hungry here. And they are more than willing to give you the recipe for your favorite dish. Here’s one for you to try at home. It’s delicious! Â Bring the stock to a boil in a large pot. Add the onions, saffron and the pepper and simmer for 1/2 hour. Add the turnips, carrots and cabbage and simmer for 20 minutes or until thy are just barely cooked. Add the zucchini, eggplant and tomatoes and cook for another 5 to 10 minutes. Then toss in everything else and turn off the heat. Allow to sit for 5 minutes to warm up the chick peas and serve. I poured mine over basmati rice. What a treat! Â This recipe makes quite a bit of stew. You can cut everything in half and make less OR… you could make the full amount and freeze 1/2 for another meal. Â I would follow the recipe up to the point where you cook the carrots, turnips and cabbage for 20 minutes. After that, I would cool it, package it and freeze it. Â When you are ready to serve it again, then I would add the zucchini, etc. and finish off the recipe. Otherwise the zucchini and eggplant might get too soggy from being frozen and then re-heated. Â This way the main part is done and you can have dinner on the table in 15 minutes! Not bad. Now, I know all of you have saffron sitting in your cupboard right now. Right?Â Â Â Â No? Well, you can usually find it a fancy food store. AJ’s is here in our neck of the woods. Some health food stores may carry it also. If you can’t find it, I would go on-line and order it from Amazon. It brings a very special taste to this dish which is hard to duplicate with anything else. You could leave it out. but it won’t be quite the same.